Hazel Williams, 93, of Boone, passed away on Saturday, November 24, 2018 at Bethany Life Community in Story City. A Funeral Service will be held on Thursday, November 29, 2018 at 10:30 am at Trinity Lutheran Church in Boone with Reverend Lindsay Watkins officiating. Burial will be held following the service in the Linwood Park Cemetery. Hazel Iona (Burton) Williams was born in Boone, Iowa on September 13, 1925, the daughter of Jess Benjamin and Emma Priscilla (Scott) Burton. She attended school at Incline Country School north of Boone. Hazel was united in marriage to James E. Williams on June 15, 1946 in Jamestown, Tennessee. She worked for the Boone County Hospital for over 50 years, retiring in 1996. 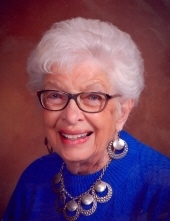 Hazel was a member of the Trinity Lutheran Church, Red Hats Club and American Business Women. In her younger years, she enjoyed riding motorcycles with her husband. Later in life, she enjoyed knitting, gardening, cooking and baking pies, especially wild raspberry and lemon meringue. She travelled to many places including, Australia, England, Scotland, New Amsterdam and Hawaii. Hazel is preceded in death by her parents; her husband and her siblings, Maxine Adams, Faye Fields and Paul, Keith and Jesse Burton. She is survived by her son, Willie H. “Bill” Williams and his wife, Chloris of Boone; three grandchildren, Kristine (Joe) Elsberry of Colorado, James “Jim” Williams of Ogden and Lance Hubby of Ogden; eight great-grandchildren, Jade Mallicoat, Darian, Marissa and Creeda Elsberry, Waylon and Nora Hubby, Dylan Williams and Ethan; two great-great-grandchildren and several nieces and nephews. Friends may call on Wednesday, November 28, 2018 from 5 pm until 7pm at the Schroeder-Reimers Memorial Chapel at Sixth and Marshall. The family will be present at this time. Visitation will continue on Thursday at 9:30 am at the Church until the time of the service. Memorials in memory of Hazel may be directed to the family and will be designated to Boone County Hospital Foundation, Shriners Hospitals for Children or the Ronald McDonald House Charities of Central Iowa. To send flowers or a remembrance gift to the family of Hazel Williams, please visit our Tribute Store. There will be a one hour visitation before the service at the Church. "Email Address" would like to share the life celebration of Hazel Williams. Click on the "link" to go to share a favorite memory or leave a condolence message for the family.